I hope you enjoy this beautiful picture of me and my haircut. It’s relevant, I promise! Even if it wasn’t relevant, it’s still a gift, so you are welcome. So last week I wrote about my relationship with food and some of the goals I have around that topic this month. I’m not going to talk about an update on that in this post because I want to save that for later in the weekend (or possibly next week if we’re being honest here). It’s a little bit tougher for me to focus on eating intuitively over the weekend so I want to get through that first. Today, I am going to write a bit about the second half of my January goal: moving my BODY! Similar to my experience with food throughout my life so far, my relationship with exercise has been a bit of a rollercoaster. Growing up as a gymnast, I never had to worry or think about my physical fitness. I was exercising almost five hours a day, five days a week. I can’t remember a single time when I was younger that I looked at my body and thought that there was something wrong with it. I just didn’t think about it at all; and for that, I’m very grateful. Dealing with a negative body image is hard enough as an adult, I can’t imagine what it feels like for a child with basically zero coping skills. I was extremely active throughout my entire adolescence, even after I quit gymnastics. I was a cheerleader in high school which, contrary to popular belief, was very physically taxing. It wasn’t until college that my physical activity really began to decline. I didn’t exercise at all when I got to college. I would walk to and from class and that was about it (although, my fellow Pitt grads know how hard that walk up to the Pete is - and I lived up there!). This lasted for about 2-2.5 years I would say. Once my eating disorders developed, I thought that adding exercise would promote weight loss even more (obviously). At this time, I started running a few miles every day. I had never been a runner before but somehow, I was doing it every day, going further each time. It’s so interesting how an addiction will enable you to do things that you never realized were possible. Fast forward a couple more years to my ED recovery. After graduating, I moved to Minnesota for work and at this time, was almost totally physically recovered. I had gained about 25 pounds back but was honestly way too afraid to start exercising yet. 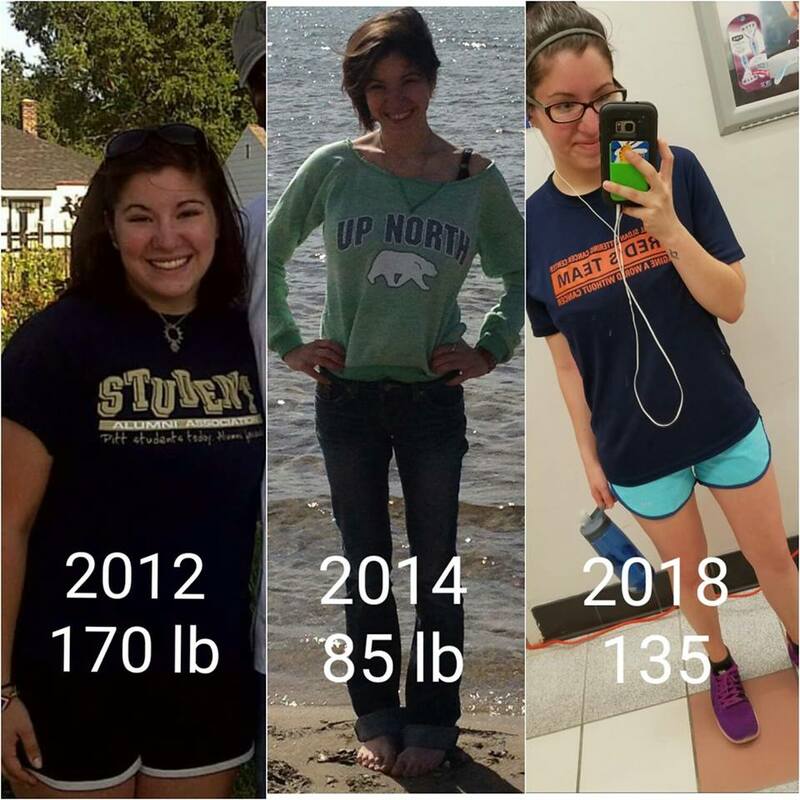 My ED experience was a very scary one for me and it totally changed the way I thought about exercise. When my ED was at its worst, toward the end of college, I lost my period completely for two years straight. The day I went to the ER with dizziness and felt like I was actually slowly dying (no exag here), I learned that my hormone levels were at the level of someone that has already gone through menopause. My doctor told me that this was really very serious and there was a good chance I would not be able to reverse the damage. This meant that I would never be able to have children, and it was one of the things that I owe my recovery to (spoiler alert: I did in fact reverse the damage). Anyway, back to Minnesota. The thought that exercising before my body was ready really made me nervous. I still didn’t have a consistent period every single month and I didn’t want to risk my health. I waited for about six more months until I finally decided to ease back into physical activity of any sort. I spent the next couple of months walking on the treadmill very slowly for just a few minutes every day. I moved into some light jogging and even ran a 5k. But in general during this time, I was only really focused on walking or using the elliptical for a maybe 20 minutes. Around this time is when Jess and I decided to leave Minnesota and move to New York. It wasn’t long after moving that I started to feel like I was really becoming healthy enough to challenge my body a little more with exercise. I started running again almost right away and was running around 3-4 miles a day. It was a steady pace that I felt comfortable with. However, it wasn’t long until I started having severe knee pain due to many injuries I had when I was a gymnast. After speaking with my doctors and a physical therapist, I chose to stop pursuing running altogether. So I joined a gym instead, looking for some other options to explore. I had no idea what was happening, but I did know that I loved to dance and quite honestly, I didn’t think I could feel any lower. So I stayed, and I danced! And seriously, it was so fantastic. I’ve always loved to dance and my coordination is really one of the only things I am SUPER confident in (thank you, gymnastics). I was shocked I hadn’t tried Zumba before. Since then, Zumba has become a huge passion of mine and I’ve even gotten certified as a Zumba instructor (nope, not teaching yet… see goal schedule!). Zumba is for another post altogether, but the point here is that I eventually found a great activity that I loved and that has been really healthy for me throughout my recovery. It’s brought me nothing but joy and has never felt like something I’m doing to lose weight. Feeling like I HAVE to workout can be a trigger for me because I never enjoyed the workouts I did to rapidly lose weight. They always felt forced, which they were, and for a horrible reason. Exercising in a way that feels good to me is what I need. What I really want to start working on now is expanding my exercise outside of Zumba - which is actually really hard for me. I’m not really confident in lifting weights, it’s super intimidating to me. I don’t really enjoy any other classes and I just don’t know how to do anything else. I was just a gymnast for what felt like forever and I never really experienced any other sports of forms of exercise growing up. But, I know that I need to start building some muscle back up again and I want to figure out how to do that. Again, in a way that makes me feel good. The first step I’ve decided to take is purchasing a workout plan from Fit with Mari. Mari is a woman who has worked to design several fitness plans, nutrition guides, workout products, etc. in a partnership with some other credible fitness sources. BTW - I purchased a 9-week strength training program for like twenty bucks. For me, this was totally worth it and way less expensive than a personal trainer! So I started this about two weeks ago and so far, it has been AMAZING. One of the biggest reasons I chose to take this route was because the program also comes with access to a closed Facebook. This online support group consists of people of all ages across the world that are also working through one of Mari’s programs. Several people in this group have had a similar health experience to mine, and the support is overwhelming. I’m so happy to be able to pursue something that is really nerve wracking for me with a really solid support system. I’m going to wait to talk about my progress so far because this post seems to be getting pretty long already but I can’t wait to talk about it in my next update!